Saturn is connected to knowledge and climbing the social ladder, but also to our restrictions, mental blocks and limitations. Represented by a cross with a sickle underneath, it is connected to time and rock: everything that's hard and lasts. Restriction, introversion, concentration, rigour, giving up, humbleness, inhibition, stinginess, prudence, sadness. 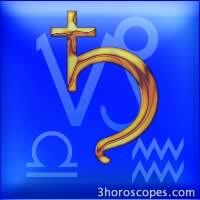 Correspondences: with the signs of Capricorn, and Aquarius (and also Libra). Squeleton, bones, skin, the color black, lead, Saturday. The father, grand-parents, policeman, judge.